Baskin-Robbins combines cookies and ice cream in new Cookie Cakes. - Celebrations Cookie Cake - Two 9-inch chocolate chip cookie crusts sandwiching a layer of ice cream (of your choice) decorated with whipped topping, rainbow confetti sprinkles, and colorful icing. 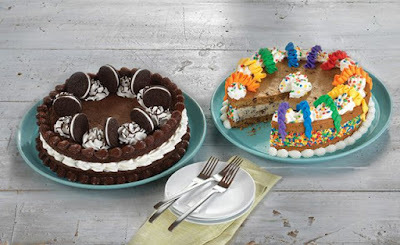 - Fudge Brownie 'n Oreo Cookie Cake - Two 9-inch round fudge brownie crusts sandwiching a layer of ice cream (of your choice) decorated with whipped topping, a fudge drizzle, Oreo cookies, and a fudge border. The ice cream chain also adds new dairy-free Horchata Ice and brings back Boston Cream Pie ice cream to be the April 2018 Flavor of the Month. Horchata Ice features hints of coconut cream with notes of cinnamon, rice, and spices, while Boston Cream Pie features a mix of Boston cream-flavored mousse ice cream and chocolate ice cream with pound cake pieces and a chocolate swirl. The chain has also brought back the deal where you can get a free upgrade to a fresh-baked waffle cone when you buy a double or triple scoop of ice cream.